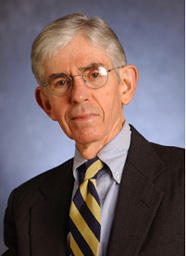 Milner S. Ball was the emeritus Caldwell Professor of Constitutional Law at the University of Georgia School of Law and a Presbyterian minister. His focus was the moment of theology for the practice and study of law. He authored several volumes, among them Called by Stories: Biblical Sagas and Their Challenge for Law and The Word and the Law, in addition to a number or book chapters and articles. The Georgia Law community mourned the death of Milner S. Ball, who retired from the law school as the holder of the Caldwell Chair in Constitutional Law in 2007 after nearly 30 years of teaching and service. This 1971 Georgia Law graduate passed away April 6, 2011, at the age of 74. Milner Ball was an amazing teacher, principled lawyer, student of the human condition, lover of food and wine and good times, stirrer-up of all manner of things, friend to the friendless, enemy of the wrongdoer, comforter to the powerless, champion of the poor, minister of the word, believer in the power and necessity of community, intellectual of the deep mysteries of life, and he maintained his dignity and sense of humor til the end which came hard, painfully and sadly. I have never known anyone who cared more about the people around him, broadly defined, as Milner Ball, and who was willing to do the hard work, and inspire others to join him, in helping the weakest among us — a minister of the word in the truest biblical sense. The many joys I shared with Milner included being his student and later his friend, grateful recipient of his mentoring and guidance, our many wonderful trips and adventures together and the honor and meaning attached to Milner baptizing our daughters. He was a special person who believed in me early on, and that belief somehow meant that I believed it too. I owe him everything and I miss him and his laugher and wisdom and love. I was sad to read that my ’72 law school classmate Milner Ball has passed. I remember him well as a brilliant student and colleague. With his religious background, we used to joke that, if he would only get an MD after his JD, he could marry a couple, deliver their babies, baptize their babies, write their wills, attend to them in their last illnesses, conduct their funeral ceremonies, and then probate their wills. He was, indeed, a man of many parts. Milner was a delightful fellow and a distinguished scholar. He will be missed by all in the UGA community. Professor Ball was, simply, a wonderful person, and I send my sincere condolences to his wife and family on his untimely passing. What a loss for us but what a gain for Heaven. As one of his Con Law students at UGA, I have great memories of his teaching. But it was in his capacity as a Presbyterian minister that he generated my fondest recollection. When I asked him to officiate at my wedding ceremony in Founders Garden in 1980 and told him my husband-to-be and I had been informed we could not have the wedding there, his response was “what are they going to do, throw us out of the garden . . . ?” The ceremony took place, in the Founders Garden, on a beautiful October Sunday before our families and a few friends. June graced us with her presence, too. I had asked Milner to use the words “husband and wife” instead of “man and wife.” Not only did he accommodate me, he pronounced us “wife and husband.” What a dear. While I graduated the Law School in 1964, I did not meet Milner until our paths crossed as neighbors on a dirt road in the North Georgia Mountains. I first saw Milner as a flashing blur as he biked with vigor for long distance. I then learned that Milner was not only a respected Professor at the Law School but an ordained Minister and author. Milner’s books had a profound impact on me as I reflected on the many challenges and opportunities for a trial lawyer to blend morality and advocacy. Milner was passionate about land conservation and his sense of doing the next “right thing” applied equally to God’s creations. I often talked with Milner’s wife, June, whose graciousness and love for Milner are so endearing. I am grateful that my life’s path crossed with Milner’s. He was a gentlemen and a scholar. Professor Ball was an intellectual giant, and a patient and gracious man who represented to me, a struggling third year student in his jurisprudence class in 1984, exactly the kind of lawyer that I aspired to be. I will never forget his kindness and compassion. I extend my heartfelt condolences and prayers to his family. Professor Ball was foremost among a handful of professors who gave me a template for being in the legal profession. Before I met him, I was almost completely disillusioned about law school and questioned whether I wanted to be an attorney. His example showed me how to integrate my own reasons for entering the law into being a happy working professional. Though we were years apart, I felt he was a kindred spirit. I can never repay him for the value of his example. But with these words, I memorialize my eternal gratitude. I am proud to say that Milner was my teacher from 1982-1985. We differed strongly on certain fundamental points, and agreed strongly on others. But agree or disagree, he never failed to be warm, kind-hearted, and extremely interesting and amusing. I’ve just thrown my head back laughing out loud at the memory. What a guy! It was a privilege to have him as a teacher and I mourn his passing. I just read about the passing of Prof. Ball. He was so kind to my wife, Meredith McKay Ellard, who was a secretarial assistant to him while I attended law school (1977 – 1980). She typed the manuscript for one of his books and always came home saying how wonderful he was to work for and with.